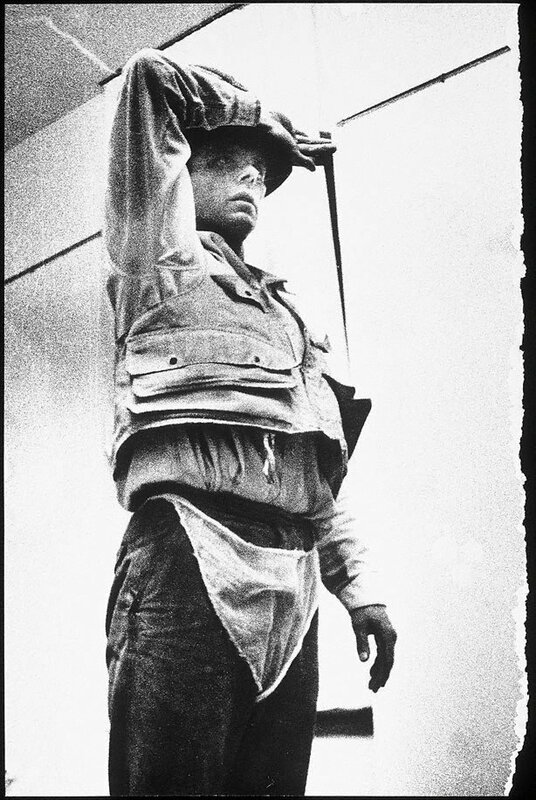 An inspiring teacher and one of the 20th century’s most influential artists, Joseph Beuys first came to prominence in the 1960s as a performance artist and major contributor to Fluxus, a group dedicated to organising anarchic events and happenings. While many of his early actions were witnessed by only very small audiences, they have become well known through the photographs of fellow artist Ute Klophaus. The action ‘Explaining pictures to a dead hare’, for instance, took place on the opening night of Beuys’ exhibition of drawings at Galerie Alfred Schmela in Düsseldorf. The invited public arrived at the gallery to find the doors locked. Through the glass front of the gallery they saw Beuys sitting in a chair with his face covered in honey and gold leaf, cradling a dead hare in his arms. Slowly he got up and wandered around the exhibition, as if explaining each work to the hare. The photographs of this action, along with others such as ‘Mainstream’, have been extensively reproduced and have taken on a significance of their own independent of the original event to become iconic images of the post World War II era. ‘Mainstream’ for example was a cathartic event in which Beuys rolled about convulsively slapping fat into his armpit and behind his knees. A survivor of no less than five near fatal crashes as a Luftwaffe pilot during World War II, Beuys saw his art both as a means of working through his guilt-by-implication in the Holocaust and of finding a language of healing. On one occasion Beuys was shot down over the frozen wasteland of the Crimea, where he was discovered unconscious by a nomadic Tartar tribe who saved his life by covering his body in fat and felt to regenerate heat. In his later actions and installations, the elements of fat and fur, combined with other non-art materials such as minerals, turf and honey, became important symbols of healing and regeneration. Beuys’ performances left behind material traces such as pieces of bitten fat and objects used during the action and these have been assembled as relics of the actions. The photographs taken by Ute Klophaus also have a reliquary feel to them with their emphasis on the materiality of the black-and-white print, with its limited tonal range and emphasis on the alchemical nature of the photographic process. Beuys had developed a very personal symbolic language drawn from alchemy, shamanism and his own personal experiences to represent his predominant themes of healing, regeneration and enlightenment as a result of personal trauma – in particular the shaman belief in heightened perception following a near death experience. Signed and dated u.c. verso, pencil "Ute Klophaus/ 1967/1997".